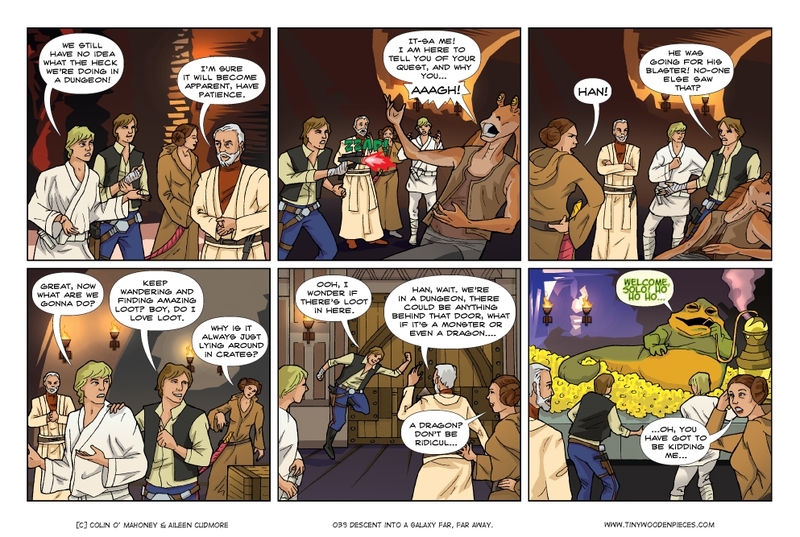 We had a lot of fun doing our last ‘Star Wars Descent’ comic, and figured a new year was a good enough excuse to return to our anachronically-challenged characters, and see how they were getting on in their dungeon. We weren’t able to get our hands on it for Christmas, and even though it seems freely available now, we will wait a while longer. Our Risk: Legacy campaign has is still ongoing, if stalled, a little, and we don’t want to get another campaign game that will just sit on the shelf for 3 or 4 months, driving us crazy. It’s frustrating that we haven’t managed to play much Risk: Legacy, but I find it hard to be annoyed, when the reason is that we have had larger number at our game night, and have been playing lighter games with more people involved. Monikers, Two Rooms and a Boom, Escape: Curse of the Temple, Coup, Resistance. Playing games that involve me genuinely laugh out loud all evening makes it very difficult to be annoyed at anything. Still, can’t wait to get back to Risk: Legacy. We didn’t do any kind of end-of-year lists on the site, but I would love to hear what peoples’ games of the year were, for 2014. More importantly, what did you play the most? Doesn’t have to have come out last year, just what you played most often, or enjoyed the most, or wished you played more of. We played a lot of Pandemic, Dead of Winter, Love Letter. We started Netrunner, but haven’t played enough of it yet to really come to grips with it, but we are both enjoying it more with every game. I wish I had managed to get Eclipse to the table more often. I think we only got in 3 or 4 games, but that was enough to make it a serious contender for my favourite board game. As for games played this year. I double checked my Board Game Geek plays to verify, but I knew it before the verification, Pathfinder Adventure Card Game: Rise of the Runelords was easily my most played game (168 plays this year). I LOVE that game and I can play it solo easily and quickly. (I play 2 – 3 characters when I play solo.) Second on that list is Shadowrun: Crossfire (26 plays). I really enjoy Shadowrun: Crossfire as well. The game that I continually wish I would get to the table more often for solo play is Mage Knight the board game. I was only able to get one play through of it this year. If it didn’t take up so much time and table space, I would definitely get more time in on it. It is the only solo-playable game that I like more than Pathfinder ACG. For non-solo playable games, Caylus is a game that I had owned for a while, but only this year started playing it more. It has really grown on me. I am really glad I was able to get back to it. A friend of mine got me hooked on a couple of Carl Chudyk games, Impulse and Innovation. I have very much enjoyed several plays of those games as well. Finally, a couple of games that I am looking forward to playing more of this coming year is Lewis & Clark: The Expedition and Vihnos. The former is a new game and the latter is one I have had for several years. I have only played a couple of games of each, but both are fun. I would love to dive into both games and a little bit more this year. That is a whole bunch of games we have never played! Not too much into fantasy/RPGs so Pathfinder card game was never really on our radar, but Shadowrun I would like to play. I think I might like that. Heard a lot of good things about Caylus, which I would also like to try. And obviously Imperial Assault. We will definitely be picking this up this year, just a matter of when. Very excited about it. I think Imperial Assault, XCOM and Thunderbirds are my most anticipated games of the year at the moment. I looked up Crossfire on BGG and I was curious about why the game contents listed ‘stickers’. That sounds like a cool mechanic, and has upped my interest in the game. Thunderbirds is based on the old Gerry Anderson TV series, if you’re familiar? It was big in Ireland/UK, not sure it it ever made it any further than that. Dated now, but it was a great show. Anyway, the game is a co-op designed by Matt Leacock, so even without the theme I’d be all in.